Are you younger or older than your cat? Find out with our cat age chart! Just how old is your cat? How do you work out how old cats are in human years? Our feline friends don't mature in quite the same way as humans, so there isn't a precise cat to human years ratio. All felines (like all humans, of course) mature at different rates. Use the charts below to help to determine your cat's age in human years and work out whether your cat is older or younger than you. The charts are really just fun guides to give you an idea of how old your cats might be if they were human. And we all know that our kitties are really just little people in fur coats, don't we! For kittens, use the kitten chart which shows the equivalent in months, rather than the adult chart. Kittens grow up much more quickly than humans, and not in evenly-spaced stages. They grow very fast in their first six months, reaching puberty at around 6-8 months old. From 6-12 months could be considered the 'teen years' in humans. Siamese kittens mature more slowly than other breeds at first, especially in the first three months, but, perhaps surprisingly, they may mature sexually earlier than other kittens. 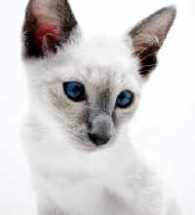 Siamese cats are generally long-lived, some of them living well into their twenties. The first year of a cat's life is equivalent to around fifteen human years. It will continue to grow and develop in its second year although as it ages its growth slows, so this second year equates to just nine human years. At two, a cat is approximately twenty-four human years old. From three onwards, one year of feline life is equal to about four years of human life. Go on then, how old am I?